I originally started collecting these notes on Gen Con to remind myself of things to bring to Gen Con. Like most of my personal pages, it has turned into a slightly out of control reference intended for anyone who wanders along. Although the focus is on Gen Con Indy, it should certainly apply to any other gaming convention. Preregister if you can. Preregistration avoids the wretched on site registration, can get you local housing, and get you into popular events. On site registration is often a nightmare. Several hour long lines are common. And once you're registered on site, if you want to sign up for events, you get into another line. Preregistering lets you get going more quickly and you can sign up for events in advance. You also save some money. Gen Con keeps growing, but as the number of players grows it's not clear that the number of events grows as quickly. There are always games to play, but if you've got your heart set on playing a game, preregister for it. Obviously, start with the gaming essentials. Pencils, paper, dice, and a comfortable backpack or shoulder pack. The primary reference book for your favorite game might be useful. You might be surprised how long you spend wandering the exhibitors area. You may end up carrying those four must-have books you purchased at the beginning for several hours. If your backpack or shoulder bag isn't comfortable, you could be in a lot of pain. 3x5 note cards and a black marker are useful for impromptu character name tags. A small bottle of pain reliever can be useful. It's easy to push one's body too hard with long nights and bunches of junk food. Hopefully you won't need the pain reliever, but if you do, you'll be happy you have it. Depending on your level of concern, you might carry some other useful emergency gear. I took along some Pepto Bismal chewable tablets in 2003. The tablets were small, and when my body complained that I was feeding it poorly I was glad I had them. Bring clothing for each day. You'll be spending each day in relatively tight quarters with highly uncertain heating and cooling. You will likely sweat each day. Your fellow convention goers will appreciate it if you wear fresh clothing each day. Bring clothing you can layer. A t-shirt and an over shirt is a good idea. Convention centers are large buildings, maintaining a constant temperature throughout the entire convention is hard. Fill that building with over 20,000 people, and the problem gets harder. Some parts of the building will be cool, some will be warm. Being able to adjust your layers is very useful. A small water bottle can be great. I just purchase a cheap local bottled water before the convention and refill the bottle throughout the convention. The beverages at the convention are overpriced and leaving a game to quick get water from a water fountain can be rude. Dehydrating is extremely unpleasant. Bringing your own food can save you some money (and is often better than what the convention center sells). More on food and drink in the "Eating" section below. Characters from your home campaigns - While I'm sure some gamemasters run games that allow these characters, in general they are not welcome. So why waste the space? Bunches of rule books. The game master generally has any supplemental books he feels he needs. You'll just tear off your shoulder hauling around unneeded books. The core book for your favorite game or two is generally plenty. So you didn't preregister? Well, you can still attend and enjoy Gen Con. You'll enjoy it even more if you follow a few handy tricks to avoid the on site registration lines. 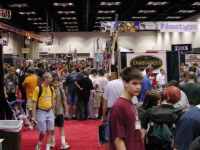 Gen Con Indy 2003 was back to lines that make amusement parks look fast. If you need to register yourself on site, avoid the morning hours. From about 8 in the morning to 1 in the afternoon is the bulk registration. Late in the afternoon or early evening the lines will thin and maybe empty. If you've got friends at the convention earlier, they can get badges for you. They can simply take off their badges and register again when the lines are short. They can register in your name, in their own names again, or in someone fictitious's name. (The following is from my 2000 experience, but based on 2003 it looks like the problems are all back.) The lines are slow because of the bad idea of collecting demographic information in line, slow software, and untrained temps. Despite the low quality of the on site registration, be nice to the staff members. The people working the registration lines are just local temps. In 2000 they had no training and generally didn't understand gaming. Being angry at them won't speed the line up. In fact, they may get frustrated and make more errors, slowing the line down. Be nice, the pain eventually ends. The theory, your convention will be packed with great games that you're running back and forth from. In reality, you'll have dead time, be unable to get tickets to an event you want to play, have an event canceled, or generally need some way to spend a few hours. Fortunately, there is always something to do at Gen Con. First, if there is an event you really want to play, but it's full, consider getting some generic tickets and going anyway. Sometimes players with event tickets won't show up. This is really common for early morning games. Also, it's not unheard of for the ticketing system to incorrectly report games as full. For a change of pace, I recommend the National Security Decision Making Game. It's like LARPing mixed with model UN mixed with Risk. Players play politicians, generals, the media and more and are dumped into a complex situation based on the modern world. You can argue and debate, you can try and build up a coalition. Or you can just invade someone. If you're really lucky, you might have access to nuke. It's very Machiavellian and lots of fun. The games are very flexible and support a large number of players, so it should be easy to join in with generic tickets. (I've only played once at Origins, so I don't know how full their game are at Gen Con. However, there are usually posters advertising the game throughout the convention, so I expect they always want more players.) The "Fast Play" four hour games are a good way to give it a try without committing to one of the full eight hour games. If you're looking for something to do and enjoy Dungeons & Dragons show up to an RPGA event with generic tickets. If you show up a little bit ahead of time with generic tickets, you have a good chance to get into a game. You don't need to be a member. Over the years I've walked into many "full" RPGA slots with generics and have never been turned away. On the down side the events continue to increase in popularity, and while ten years ago I played with generics repeatedly without ever being turned away, it's much riskier these days. I haven't played in several years, so I don't know how bad the situation is these days. Also, if you're trying to get into any of the "Living" games, make sure you have a character in advance. RPGA HQ generally has the character creation rules for those events at their desk, and often have pre-generated characters for people who just want to grab a character and play. The up side of the RPGA event demand increasing is that they are always looking for GMs. If you're interested, sign up with the RPGA in advance and offer to run events. They provide the module, you just need to read through it a few times and you're ready to run. If you run enough events, they'll cover your admission badge and your hotel! While you're wandering the convention, check out the costumes. Many people put a great deal of effort into creating some impressive costumes. Saturday is the best, there is a costume contest that afternoon that is fun if you're not otherwise busy. If you're going to be at the convention Friday morning, Tracy Hickman's Killer Breakfast is mandatory. As Tracy puts it, it's the game that takes the D&D loophole, "the DM is always right," and drives a truck through it. Tracy (with help) runs a single D&D game on stage. Death is fast and frequent. When a character dies, the player leaves the stage and a new victim added to the group. Eventually every character dies. On a good year, 200 player characters die. It's usually very funny, even if you just watch. On the down side, over the last few years some of the spark seems to have left the show. Additional mini games and multimedia failed to add anything and dragged it down. If you're into anime, you'll never be bored. 24 hours a day throughout the convention, one or two anime rooms show anime. Much of it is hard to acquire in the US and is lovingly fan subtitled. There is usually a 24 hour listing of upcoming showings in front of the room. In 2003 there were two anime rooms, so you got a selection. For the last several years the convention has run a convention-wide game. The first two years have been the "Time Warp" game. It's a combination puzzle game and scavenger hunt. 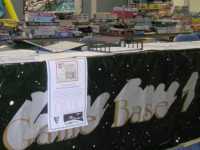 Posterboards with individual puzzles are scattered around the convention. Everyone who finishes wins something, and you even win something if you only solve some of the puzzles. Grab a friend or three and head out to solve it! Want to play a game right now? Check out the Board Games HQ. Game Base 7 will rent you all sorts of games for a buck. Grab a few friends and check out some games you're interested in, or maybe just something that looks wacky. For a buck, how can you go wrong? 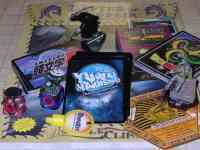 During the day a number of board game companies run game for anyone who wanders by. For the last few years a play-by-mail company has run a free convention long game that can be fun. If you're into fantasy art, check out the art show. It's free and a fun way to kill some time. The game auction is also surprisingly fun. It's fascinating to watch them auction old games (check the schedule). The auctioneers really know their stuff. "This copy of the original Dungeons & Dragons is still in the original shrink wrap. The shrink wrap has holes in it, but that's a good sign that it's authentic. The shrink wrap machine we had back in the 70s really sucked and always left holes." Even if you're not interested in the auction proper, you can browse the store where stuff that doesn't make it up for auction is sold. Unfortunately many people have an inflated idea of the value of their old stuff, but there are usually some gems to be found. Try to stop by as early as you can, the good deals are snapped up quickly. Last, but certainly not least, check out the exhibit hall. Between 10am and 6pm the exhibit hall (or dealer's area) is open. You can easily spend eight hours just walking up and down the aisles looking at interesting games and playing free demos. The crawl is a Gen Con tradition. Avoid Saturday if possible, Saturday is extremely busy. I've wandered the dealer's area on Saturday every year, and it's fun, but it's more fun on the other days when the crowds are smaller. Thursday is best, the hall isn't crowded, the dealer's aren't tired, and you can easily play free demos. Many exhibitors have demonstration games. These games tend to be set up to highlight everything good about the game. So if you see an interesting looking game, or have been considering some game, definitely see if a demo is running. While crawling the exhibit hall, be on the lookout for offers of free stuff. Sometimes companies will give away overstock, or to promote a new game they'll give out a single piece to the game. Over the last six years I've gotten starter decks for a number of trading card games, a few free rule books, a few miniatures, and other wacky stuff. Sometimes giveaways are listed in the event book or on fliers, sometimes it's a pile of free stuff with a "FREE" sign next to it, and sometimes it's given away to anyone who looks at the product. Note that some booth staff, desperate for a sale, or at least someone to pay attention, will trap you. They'll ignore the "I'm not interested" body language and continue to talk as long as you don't walk away. You can waste a lot of time listening to boring stuff if you don't take control. If you're not interested, just say "Thanks" and walk away. That would be rude typically, but any staff member ignoring your disinterest in being rude to start. If you are interested, ask pointed questions. Don't waste time listening to details you don't care about. For example, I'm completely uninterested in rules for role-playing games (ultimately almost any rules set is okay), but I'm very interested in interesting game worlds. If someone starts telling me about their game system, I'll just tell them "I'm not interested in game mechanics. What's unique and interesting about your game world?" Be blunt and direct, you'll enjoy yourself more and the dealer won't waste him time. 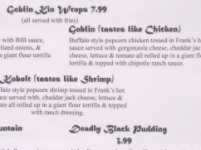 Food at any convention center is overpriced and typically low quality. Save your money for buying more games, or at least getting better food. Most convention centers frown on bringing outside food inside. The convention center expects to make easy money on their overpriced food, and resents competition. In practice, don't ask, don't tell. If you're not blatant, you can bring food in without a problem. A friend of mine was stopped from entering with a bag of popcorn. The convention staffer very specifically pointed out that he couldn't let anyone visibly carrying food. A quick trip around the corner to stuff the popcorn into a backpack and we walked right by the smiling staff member. Don't count on all staff members being this nice, hide the food before approaching the convention. So, definitely bring food to the convention. You're going to get busy and not want to leave the convention center for food. Small, portable food like sandwiches, candy bars, and granola bars, work best. I pack a loaf of bread, some peanut butter, some jelly, sandwich bags, and a few plastic knifes. Compared to purchasing food at the convention center it's amazingly cheap, even if you end up throwing most of the peanut butter away at the end of the convention. Bring a water bottle. The convention center can get hot, and you'll perspire. You might end up skipping a meal because you're busy. You can go a few days without food, but you need to stay hydrated. Dehydration can give you a splitting headache, ruining a game. I speak from experience here. I usually buy a cheap bottled water before the convention, then refill the bottle from water fountains at the convention. Drinking a few glasses (or bottles) of water a day has kept me a lot happier. If you are in the mood to spend a little money on food, check out the neighborhood restaurants. Local visitors or tourism bureaus will often staff a table with nice old ladies near the front entrance. They'll have a map of the area with restaurants marked. Failing that, there will at least be a pile of free restaurant maps somewhere, try asking your hotel front desk. "Doc Speaks: The Indy Guide Intro Version" has plenty of good information on restaurants in the area of Gen Con Indy. Gen Con Indy event databases. Easier to search than the official database. I've broken this page up into several city-specific pages. Information on local restaurants, hotels, entertainment, and the convention sites. Indianapolis, Indiana - The new home Gen Con Indy, successor to the Gen Con name. It's a good convention and a good city. Milwaukee, Wisconsin - Gen Con used to be here, but no longer. Several new conventions have sprung up, so hopefully this information is still useful. Details on specific conventions I've attended. If you're considering attending a given convention, the previous trip reports might provide you with some useful information. 2007-08-11: Bunches of updates and clean up.